Sony hasn't produced a downright good comic book movie since 2004 with Spider-Man 2. While cinema is largely objective, that's probably pretty close to a generally accepted statement. With Spidey hanging out with his Avengers pals, the studio is trying to make use of their library of Marvel characters, all of them at least tangentially related to Spider-Man who, for contractual reasons, can't show up in these movies. If such a thing must happen, Venom seems, or seemed rather, like a good place to start. Unfortunately, this is very much a comic book movie that feels like it's learned nothing from the last decade or so and mostly winds up being a full-on trainwreck. Yet one that winds up being enjoyable on some level for those who allow it. Venom centers on Journalist Eddie Brock (Tom Hardy), who, despite being good at his job, has hit a few roadblocks, mostly of his own doing. His latest do-good venture? Trying to take down Carlton Drake (Riz Ahmed), the notorious and brilliant founder of the Life Foundation, who clearly has some shady dealings going on underneath his public persona. 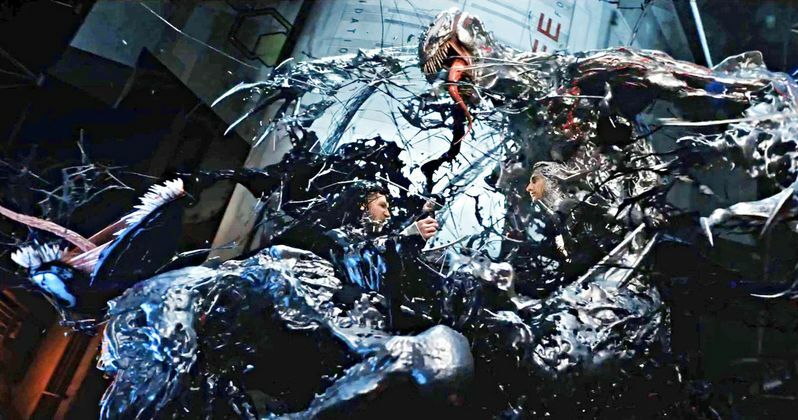 While investigating one of Drake's experiments, Eddie comes into contact with an alien life form, which the Life Foundation has taken to calling a Symbiote, and his body merges with the alien. This gives Eddie superhuman strength and power, yet it comes with the undesired side-effect of a violent, Twisted, split personality. Despite the danger, Eddie must try and wrangle this power in order to stop a major threat to humanity. 2000's X-Men is largely credited with being the first good comic book movie of the modern era that helped kick off the age we're in now. But it was really when The Dark Knight and Iron Man hit in 2008 that the genre was cemented as something to be taken very seriously as more than a fad. Some hard lessons were learned in that eight-year period. Venom feels like a movie that would be more at home in that era than it does in the modern comic book movie world, akin to something like Ben Affleck's Daredevil or, dare I say it, Halle Berry's Catwoman. It's clumsy, uneven, generic and feels like a product that a studio threw a bunch of money at hoping that spectacle and some big-name actors would be enough to do the trick. We've come a long way since that kind of thinking was generally accepted with these movies. But Venom suffers so much for so many different reasons. We have a generic, mustache-twirling (sans mustache) evil corporate bad guy, lame CGI and a tale that is very much fighting against its PG-13 rating at every turn (seriously, this movie should have been R-rated and much more streamlined). Not to mention the Michael Bay levels of pointless explosion-filled action sequences. It's the biggest and noisiest kind of stupid there is. It's also hard to know who to point a finger at. Tom Hardy is one of the finest actors we have and he can't even come close to saving this dumpster fire. Hardy is known for committed performances and making interesting choices. Nobody could accuse him of making uninteresting choices here. But are they good choices? That largely depends on the viewer, probably. It's also unfortunate that a great cast, which includes Michelle Williams, Riz Ahmed and Jenny Slate, is completely and utterly wasted. Their characters aren't given anything interesting to do and it would be tough to blame them for this movie's many, many shortcomings. Side note/warning; this movie may feature the most uncomfortable kiss in cinema history. So there's that. Then there's director Ruben Fleischer, best known for his work on Zombieland. He always seemed like an interesting choice for the gig and, on some level, it seems like he did what he was hired to do. Was this movie his singular vision? If it was, shame on him. But it doesn't feel that way. One thing that can be said for the final product is that it ends up being unintentionally funny on a staggering level. It's the kind of thing the Mystery Science Theater 3000 guys would love to get their hands on some day. Does that make it good? No. But by some measures, it does make it entertaining to certain types of moviegoers. But that's not what anyone was trying to do here. Venom is a visually unimpressive, disappointing and head-scratchingly bizarre, simply not good comic book movie. This is not the start to some glorious spin-off comic book movie universe. It's the first and final nail in a smelly coffin. Sony has demonstrated, hopefully for the last time, their ineptitude when it comes to this sort of thing.